We have been online since 2001. Our Secure Online Store accepts Visa, MC, Discover and American Express. CFM Technologies has been featured in Truck Magazine and Horsepower TV for our Chevy / GMC Performance Throttle Body Injection Parts. We specialize in not only GM TBI fuel injection performance and repair parts, but also carburetor spacers. Best 4500 to 4150 adapter / spacer going ! All the same features as our #PP-100 (to the left) but with custom hardware to mount the dual air cleaner hold down stud applications. 4.3/5.0/5.7 - These CFM Tech Ported throttle Bodies are designed for maximum airflow with ported throttle bores, larger butterflies, thinned throttle shafts, button head butterfly screws, and machined top air entrance. CFM-Tech's GM Tbi Injector Spacer. Easy to install and easy on your wallet. 5-7% air flow increase for $21.95! 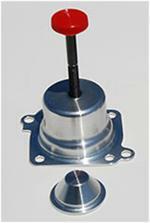 Our fuel psi guage to fuel line adapter mounts inline directly to your GM tbi throttle body!! !